This is almost one of those posts which cause you to want to avert your eyes in all honesty. It's not really a diet-lovin' sort of book. Definitely one I probably shouldn't be looking at post-baby (or anytime, really) but I do like candy. Plus, it's Monday. One should encourage many happy thoughts on Mondays. Candy is a happy thought. Enter: Dylan's Candy Bar : Unwrap Your Sweet Life. I don't know who Dylan is and I barely know what her candy bar is. 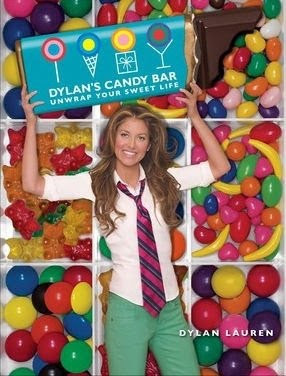 According to my online "research" for this book, Dylan likes candy and owns a swanky candy shoppe in New York City (that I wish I had known about when I visited last year!) There's also one in Florida and one in Houston, Texas if you are wondering. Which I was. If you like candy you will probably want to know about these stores. This book isn't half bad either. "I believe in candy, not just for the endorphin high it gives when consumed but also for its ability to transcend time, space, and a really bad hair day. Candy is magic! Candy is imagination! Candy is art! Candy is always in fashion! Candy is joy! Candy is memories! And candy is childhood - the best and the brightest moments you wish could have lasted forever!" Part of me wants to yell out, "Amen, sister!" and the other part of me wants to see her in the same room with Jillian Michaels. From the introduction on, we learn what it is that makes Dylan love candy and the many ways it can be enjoyed during the course of one's non-Weight Watcher lifetime. She discusses the beauty of the colors, the texture, the history of lollipops and gum, and "how to live the sweet life." Ok, so perhaps this book isn't entirely practical, per se, but I did enjoy it. It's a feast for the eyes for one thing. Truly, the bright bold photography is eye-catching and makes you slowly turn the pages. In fact, I enjoyed the photography so much that I could almost forget about the food. Almost. Not quite. I like the book because she offers good tips and ideas for how to use candy when throwing various parties. From baby showers to weddings, Dylan makes suggestions for what candy to bring in to celebrate the event with. One thing Jonathan and I have noticed at weddings lately is the use of candy. It's becoming a trend to serve candy at wedding receptions and so it's fun to think about ways to display and serve it. Candy is "in" almost as much as wedding cake which is intriguing and, dare I say?, fun! It's different. Unique. And personal. I can't say that I've ever seen a book quite like this. It's different and unique and makes you want to raid the candy section of your local grocery store and plan a trip to NYC or Houston for the sole purposes of eating a bagful of Skittles. If I thought I could resist the sugar, I'd definitely use candy to decorate for parties and events more frequently. As it is, I still might. I'll just have to use candy when I know I'll have a large crowd to help consume the goodies! Personally, I enjoyed looking through and being inspired by Dylan's Candy Bar. If you are looking for fun party ideas or perhaps love candy as much as Dylan does, then this might be right up your alley. Thanks to The Crown Publishing Group for sending a copy of this one my way. "Part of me wants to yell out, "Amen, sister!" and the other part of me wants to see her in the same room with Jillian Michaels." Ha! That cracked me up. I could almost get a sugar high just looking at the cover. Oh, I know who Dylan is! Only because I happened to watch the Oprah episode last week with Dylan's dad, designer Ralph Lauren. I haven't watched Oprah in 9 years, but I'm recording her last few shows in case they are really good. I went to a wedding recently where there was all kinds of candy in these beautiful glass jars for guests to scoop into little take-home goodie bags. Sweet! I'm not that into candy, actually, especially hard candy. I'd much rather have a brownie! I've been to the store several times. It's a very fun treat while in NYC. My kids LOVED it as you can imagine. So when are you coming to Houston???? Amanda and I have been to the NYC location several times. I would have mentioned it, but it's really out of the way -- not near other touristy areas.